Creamy, lite, and refreshing! Almond milk is a great alternative to soy or dairy. 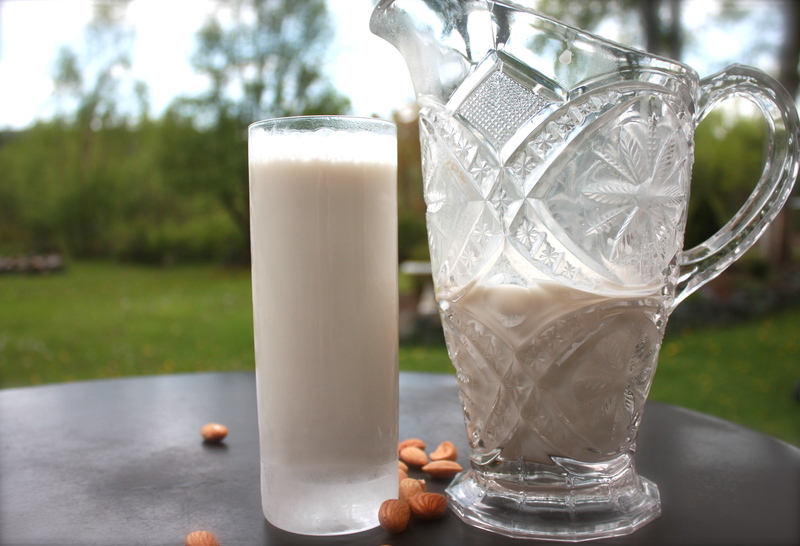 You can use cashews, Brazil nuts, or hemp seeds as well as the almonds shown here to make nut milk. A serving of almonds provides 175% of your daily needs for Vitamin E. Almonds are a great option for people on a low-carb diet as well as for people looking to lower their cholesterol and reduce their risk for cancer and heart disease. What we love: It is so easy to make and really delicious on granola or cereal. It lasts for around 5 days so you can make it in large batches. What we love less: It’s all good! Though not necessary, it’s best to soak the almonds overnight, covering them completely with water. Soaking them amplifies their nutritional value. Take the one cup of almonds and 1 cups of water and put it in the blender. Blend on high for 1-2 minutes. Gradually add the next 3 cups of water. The Agave and Vanilla are optional, add them at anytime if so desired. If you want the milk to be creamier add 3 cups of water instead of 4. Optional: Straining the almond milk through a cheese cloth or nut milk bag brings out the smooth, creaminess of the milk. Strained milk will be much more similar to what people typically expect milk to be like. You can take the “pulp” and put it in your dehydrator and it becomes almond flour which has all of the nutritional value and benefits mentioned above. Great option for people with a gluten intolerance. Alternately you can use it in smoothies and you won’t have to dehydrate it. If you are pressed for time you can put it into a ziplock and put it immediately into the freezer, until you have time to dehydrate it. You can also dehydrate it in your oven. Turn the oven to 175 or whatever the lowest temperature is. Put it on a tray and keep it in for an hour or until it is completely dry. Put it in your blender, just enough to cover the blades. It will become a fine powder. You can store it in your freezer. This entry was posted in Breakfast and tagged almond, almond flour, almond milk, health, milk, nut flour, nut milk, vegan. Bookmark the permalink.